The global trend in Luxury Watch resale has been growing for a number of years now, with the pre-owned market now an estimated $5 Billion per year. Several brands in the sector, including Tag Heuer, Breitling and Richard Mille are now said to be considering how to take advantage of this opportunity for new revenue streams - whilst Audemars Piguet has announced plans to open standalone stores to serve the purchase and selling of pre-owned timepieces. 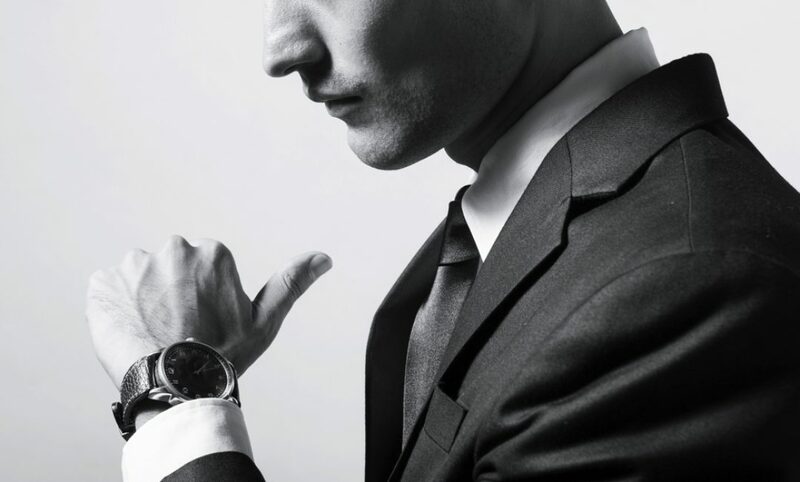 This move offers a considerable advantage to the Luxury Watch consumer too, our analysis of high net worth individuals (HNWI) confirms that the need for product expertise is paramount when purchasing products for this group - and let’s face it, there are no better providers of this expertise than watch brands themselves when it comes to their own creations. Which Brands see the most interest? Using audience conversation data from social media and leading watch forums, and of course being careful to filter out any references to replicas, we examined which brands saw the largest conversation share relating to the resale of luxury watches in order to understand the potential opportunity for each. 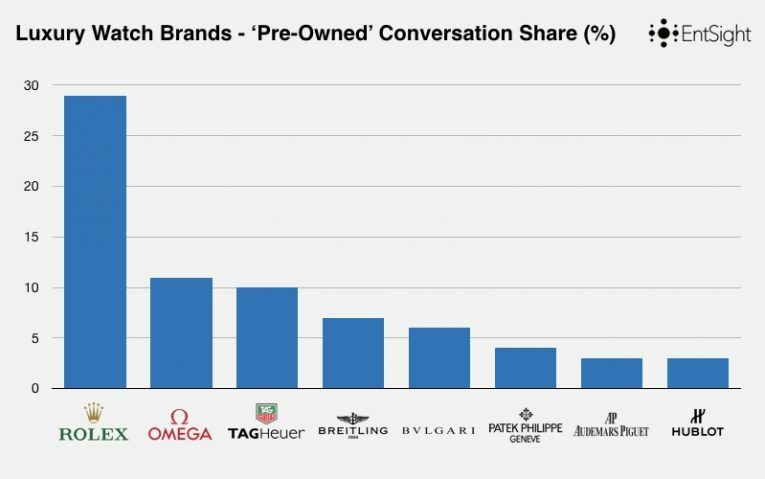 Unsurprisingly given the huge popularity Rolex (29%) saw over a quarter of pre-owned and second hand watch conversation, with our data suggesting the brand have seen a noticeable increase in conversation relating to pre-owned watches over the past six months. Omega (11%) and Tag Heuer (10%) also saw large shares and so there is a significant opportunity for these two brands in this space too. For brands who are considering following Audemars Piguet’s example of a retail model to drive revenue from the pre-owned market understanding the opportunities in each region will be key to success. 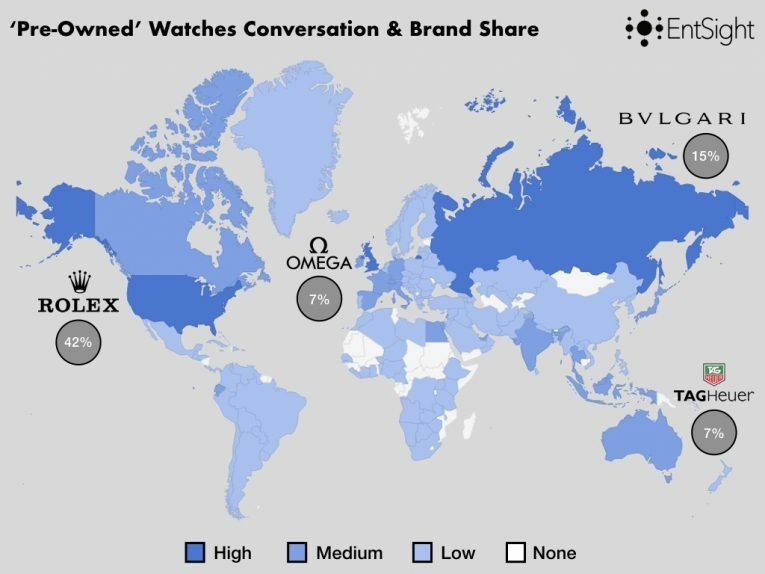 Using our audience data we mapped where pre-owned Luxury Watch conversation was strongest and discovered that the U.S, U.K and Russia saw the largest shares, with Western Europe, India and the Pacific Rim also seeing interest. As you’d expect, different markets saw varying conversation related to brands, and it is this insight which could inform how brands develop their retail operations for each country. A Means To Engage Younger HNWI? Our prior analysis of younger HNWI suggests that whilst the pre-owned market may well offer this consumer group an entry point into the world of luxury watches the methods by which to engage them will likely have to differ somewhat from those for older generations. Given this audiences need to immerse themselves in the stories of brands, as well as the value they place on experiences rather than objects, it is essential that Luxury Watch brands work to leverage their rich and compelling histories alongside their expert knowledge of products. 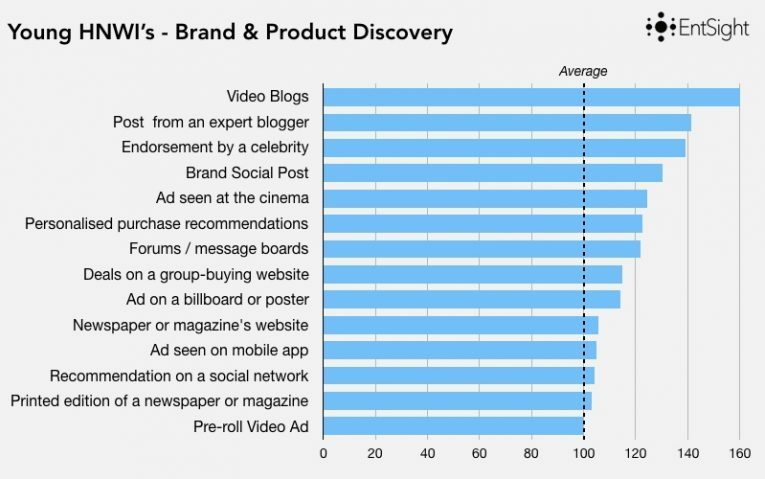 Our consumer insights for 16 - 24 year old HNWI confirms that video blogs (Vlogs) are the most popular method of brand and product discovery, and so Luxury Watch brands will certainly need to learn how to demonstrate their product expertise and storytelling skills through this medium. Furthermore, they’ll need to do so via social platforms such as Snapchat and WhatsApp which are currently popular with this younger HNWI group. Over the past few years EntSight has worked with leading Luxury Watch and Jewellery brands including Piaget, MB&F, Bulgari and Graff to help them understand and drive value from their audiences.